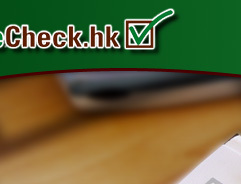 ReferenceCheck.hk is a full service reference screening company, founded by experienced former Head of Compliance & Administration who worked in credit bureau in Hong Kong, providing background screening for employers and landlords. ReferenceCheck.hk combines human resources, public court records and credit bureau in providing your solutions with fast, reliable and cost effective (no set-up fees and no minimums) pre-employment screening services. It intends to use reports to evaluate background and help prove the proper due diligence in hiring or promoting decision for an employee or renting a flat executed.